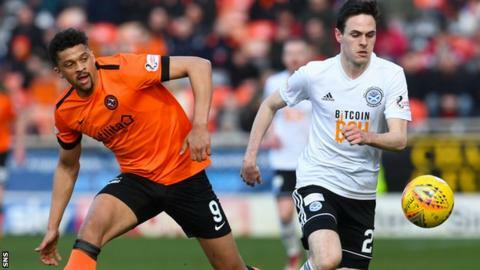 Ayr United right-back Liam Smith has signed a pre-contract with Dundee United. Smith will move on a two-year deal at the end of the season. It was reported on Thursday the 23-year-old had agreed to join United. Smith appeared in the sides' Scottish Championship meeting on Friday and Ayr boss McCall was unhappy at the timing. "It's a wee bit sad a club of this stature having to put it out the night before a game," McCall said. "But I hope he comes and does really well. We heard about it in January and he hadn't signed anything - I think it's done now." Smith started his career at Hearts, making 30 appearances before a successful loan stint at St Mirren earned him a move to Ayr last summer.